Free shipping. Buy direct from HP. 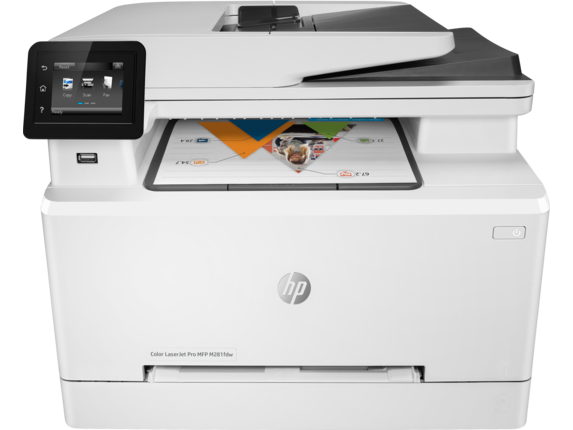 See customer reviews and comparisons for the HP Color LaserJet Pro MFP M281fdw. Upgrades and savings on select products. Get the fastest in-class two-sided printing speed and First Page Out Time (FPOT). [1, 2]Breeze through tasks with a 50-page automatic document feeder.Scan digital files directly to email, network folders, and more. Print documents directly from a USB drive.Stay productive and change paper less often with a 250-sheet capacity paper tray. Count on high-quality color and more pages with Original HP Toner cartridges with JetIntelligence. Spend less time replacing toner, with optional high-yield cartridges.This printer helps detect, stop, and give notifications of security breaches.This printer includes write-protected memory that helps prevent malware intrusion. Count on high-quality color and more pages with Original HP Toner cartridges with JetIntelligence.Spend less time replacing toner, with optional high-yield cartridges.This printer helps detect, stop, and give notifications of security breaches.This printer includes write-protected memory that helps prevent malware intrusion. Get simple setup, and print and scan from your phone, with the HP Smart app.Have confidence in your connection with steady performance from dual band Wi-Fi®.Connect your smartphone or tablet directly to your printer – and easily print without accessing a network.Simply tap the print button on your smartphone or tablet to print. 1 Compared with the majority of color laser AiOs < $450 USD and Print Speed 0-30ppm, based on market share of IDC CYQ3 2018 Hardcopy Peripherals Tracker. Automatic Duplex Printing Speed based on manufacturers’ published specifications as of November 9, 2018. See hp.com/go/printerspeeds. 2 Comparison based on manufacturers’ published specifications for First Page Out Time FPOT as of March 6, 2017. Includes color laser MFPs < $450 USD and printers < $300 USD based on market share as reported by IDC as of Q4 2016. See http://www.hp.com/go/printerspeeds 3 For details on local printing requirements see http://www.hp.com/go/mobile printing 4 Wireless operations are compatible with 2.4 GHz and 5.0 GHz operations only. Learn more at http://www.hp.com/go/mobileprinting. Wi-Fi is a registered trademark of Wi-Fi Alliance®. 5 Optional HP JetAdvantage Security Manager for additional purchase. Available on select product models and firmware versions. See product documentation or see http://h10032.www1.hp.com/ctg/Manual/c03601723 (PDF 372KB) for details. 6 Based on cartridge yields for HP 201X compared with HP 202X Original HP LaserJet Toner Cartridges. For more information, see http://www.hp.com/go/learnaboutsupplies 7 Requires the HP Smart app download. Features controlled may vary by mobile device operating system. Full list of supported operating systems and details at http://support.hp.com/us-en/document/c03561640. For details on local printing requirements see http://www.hp.com/go/mobileprinting 8 HP Auto-On/Auto-Off Technology capabilities subject to printer and settings; may require a firmware upgrade. 9 Requires Amazon Alexa, Google Assistant, or Microsoft Cortana and an HP web-connected printer registered with Google Cloud Print or ePrint. For ePrint account registration, see www.hp.com/go/support/eprint. 1 Compared with the majority of color laser AiOs < $450 USD and Print Speed 0-30ppm, based on market share of IDC CYQ3 2018 Hardcopy Peripherals Tracker. Automatic Duplex Printing Speed based on manufacturers’ published specifications as of November 9, 2018. See hp.com/go/printerspeeds. 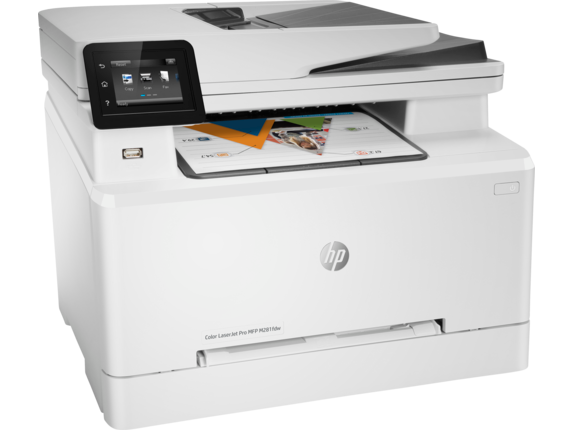 When your office or workgroup is ready to upgrade their print power with a new device, you’ll find straightforward and efficient multi-function printing from our durable all-in-one, the HP Color LaserJet Pro MFP M281fdw. Designed to provide serious performance, this device is exactly what any team or busy professional needs to guarantee top-quality documents and output around the clock. Are you tired of the hassle of trying to find print supplies when big jobs take their toll? Whether it’s a dwindling supply of ink or a toner cartridge you find running out too often, we’re there for you with quick print specs and a load of built-in features to keep everyone happy and their heads in the game. Beyond its standard functions, this HP Color LaserJet Pro is ranked best-in-class among our multifunction office printers and bests many others for speed of two-sided printing and first-page completion. With a surprisingly accessible price point, it’s an easy fit for many scenarios, from a team setting with varying needs, to a busy solo office where consistent quality matters most. Boasting a recommended monthly duty cycle of as many as 40,000 pages, the HP Color LaserJet Pro MFP M281fdw will have no trouble keeping up with whatever work throws at you. For those concerned about printing in high volumes or need to print in a rush, we’ve built extra efficiency features into each of our HP Color LaserJet Pro MFP M281fdw printers to help you save time and boost your office output wherever it fits. 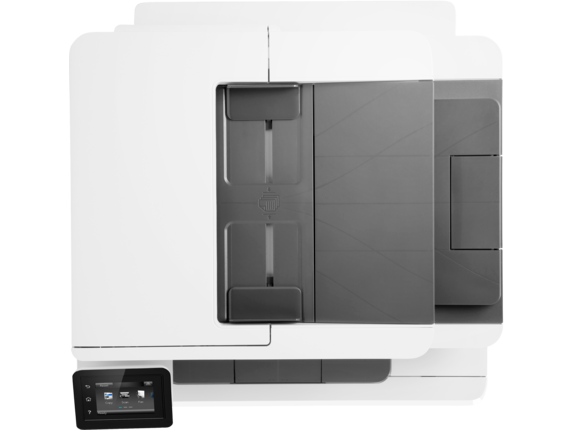 Print, scan, copy, and fax worry-free, all from one device. Of course, the foundation of this printer’s value and user experience is its print speed, and you’ll be glad to know it boasts a rating of as much as 22 pages per minute when you print using either black or color ink. But we didn’t stop there. In addition to a peppy print time for all ink types, each HP Color LaserJet Pro incorporates automatic duplex printing without sacrificing print time. You’ll also find an automatic document feeder and high-capacity paper tray with room for as many as 250 sheets, so you won’t have to add more paper after every big job. Do you spend a lot of your workday on the move? 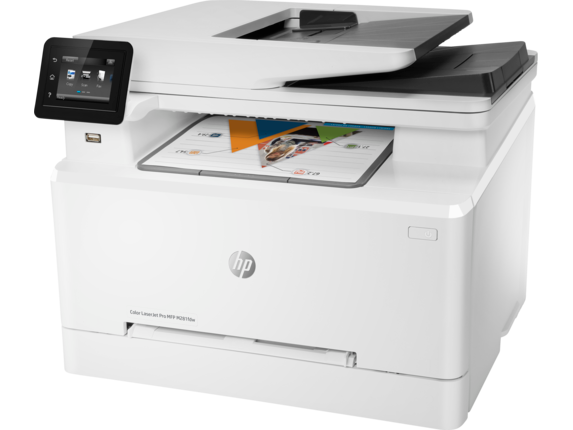 If so, you’ll get a lot of use from the HP Color LaserJet Pro’s mobile features. It’s set up to quickly sync with your smartphone or tablet and provides a greater ease of use than you might find with a typical interface. Mobile printing or scanning is a cinch, too, with the HP Smart app. You can even use it to order new ink or toner cartridges when your printer starts to run low on supplies. You can also scan files directly to your phone or mobile device. Worried about keeping a stable connection? With dual band WiFi built right into every printer, you won’t have to. The HP Color LaserJet Pro MFP M281fdw’s router broadcasts at 2.4 GHz for longer distance connections, and 5 GHz for higher speeds when you find yourself in closer proximity. This printer is also secure against fraud or data theft. But if you’re concerned about hardening your office’s security even further, consider adding our optional HP JetAdvantage Security Manager to your laser pro workflow. Want to back up your HP Color LaserJet Pro MFP M281fdw’s performance with a convenient long-term supply solution? Then keep your office stocked with HP Original high yield ink and toner cartridges designed to provide consistently high-quality color prints and a higher print volume with each unit. For document-heavy printing and scanning routines, your printer can be resupplied with an HP 202X High Yield Black Original LaserJet Toner Cartridge. Or if you need to work in color, consider our HP 202X High Yield Original LaserJet Toner Cartridge in magenta, yellow, and cyan for a full range of colors that will keep your work looking vibrant. And with HP JetIntelligence technology on your side, you can manage your printer’s performance directly so you can achieve more efficient printing as you accumulate hands-on experience. See how your device behaves in real-time for insight into a variety of tasks, from small and complex jobs, all the way to the bigger and more time-consuming ones. As the average office shrinks and the portfolio for most professionals continues to grow, it’s more critical than ever to work with a printer that you know offers efficiency across the board. 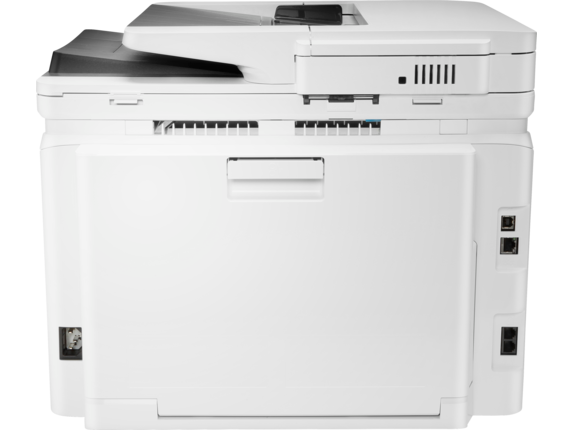 The HP Color LaserJet Pro MFP M281fdw is designed to save space and fit seamlessly into any environment while serving as a powerful media hub with surprisingly slim measurements at only 16.5 x 16.6 x 13.2 inches. That’s extra space for you and your coworkers, or just for you and your work. It’s even environmentally friendly and easy on your utility bill. There’s no need to worry that you are wasting money on your electric bill with the assurance of ENERGY STAR® certification. You’ll also be protected by our standard one-year limited warranty when you buy, so there’s no need to sweat the unexpected. With a competitive price and impressive print specifications, the HP Color LaserJet Pro MFP M281fdw is a true standout from our durable line of HP LaserJet Pro family of printers.